A company’s responsibility does not end with the customers they serve or the goods and services they offer. Environmental responsibility means that a company makes conscious, successful efforts to demonstrate clean production techniques, dispose hazardous waste in a proper fashion , minimize energy use, and continue to enhance their ability to minimize waste and energy. In an effort to establish environmental responsibility standards in the web printing and converting industry, the Tag and Label Manufacturers Institute created the L.I.F.E.® Program. 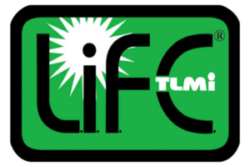 To become L.I.F.E.® certified, a company must meet the standards set forth by TLMI that promote environmental responsibility. This includes everything from waste produced by the factory to energy used in the front office. In order to maintain the certification, companies must complete a rigorous review by an independent, professional auditor every two years. This creates an incentive for companies to maintain their efforts and make the possible improvements. Seeing as how it is not always convenient to be environmentally responsible in the printing and converting industry, many companies choose to take the easy way out. Coast Label Company has been L.I.F.E.® certified since January of 2011, and we look forward to continuously decreasing our impact on the environment. In order to become L.I.F.E.® certified, companies must demonstrate successful efforts to minimize their environmental impact. Following the initial certification, companies must complete a rigorous audit every 2 years. Coast Label Company has been L.I.F.E.® certified since 2011, and is one of the only manufacturers in the United States to be certified. The bottom line: The conscious effort to minimize a factory’s impact on the environment is a reflection of the company’s culture and values. Of course, it would be cheaper and easier to irresponsibly dispose of materials, but cheap and easy are not usually synonymous with superior and responsible.